Easily make VR tools and run them in Unity. EditorVR is now available for free, today! You may have been following our progress with constructing environments for VR in VR. Now it’s your turn. Today, you can download the EditorVR Experimental Build and the EditorVR Unity Asset Package. There is so much more we’re looking to add, but we think that enough of the foundation is there that we no longer want to hold this out from the community. At Unity Labs, we are on a mission to explore the long-term view of where creation technology is headed. At our Unite demo last month we gave a final peek at the experience of building out an environment in real-time using VR-specific UI (many thanks to our friends at Campo Santo for providing the beautiful Firewatch scene). You can build directly in the headset, on both Vive and Rift. Learn more about how to use it here. We’re launching with an open API and invite you to experiment and customize to your liking. If you need help or want to join the conversation, head to our brand-new EditorVR forum. There, you can also learn about Tools, which are VR-specific extensions to EditorVR. At Unite 16 Los Angeles, Timoni demonstrated two examples of Tools: Tvori, an animation tool, and Creations, a sculpting tool. We can’t wait to see what you build and share! there are any tutorial to teach us how to make the menu, like editor vr ? I am very interesting about the menu. So is it possible to get this to work in 5.5? Not currently as there is only a 5.4 build. However, we’re going to move to 5.5 within the next or following release. I have HTC Vive and I have a problem with EditorVR. It keeps drifting and rotating automatically. The problem occurs only with EditorVR. Games work great. New shortcuts to learn (kinesthetic this time). I’m just missing a way to get a plugin editor window to be added to the menu to be used. Hi, can the links or files being linked be changed to a Unity link or files be placed in a public Dropbox? Our network security is blocking it claiming it is Malware. Love u , For the best gift of my life. I really want my work station like that well Thank a lot for your cooperation. Really Fantastic, I make my life dream true. I am really Happy and Really Exercised. Hi, thanks for the article. I made a ‘hello world’ video tutorial for getting stared with Unity5 EditorVR (featuring Oculus Touch controllers). I hope this helps people get going! Thanks for the great effort, and for making the API open! FYI: I wasn’t able to run the build. The editor constantly showed a blank Asset Store window, and importing SteamVR from a previous project/package showed many errors in the console, and crashed the editor constantly. I uninstalled it and reinstalled twice, rebooted, but kept getting the same error. I was getting failure to login into asset store under 5.43 (getting DBI error), so imported steamvr using unity 5.5, exported it, then imported it into 5.43 (installed in another home). This editor is brilliant stuff , great work. Cant wait to see it evolve … ! Thanks! I’ve been dreaming of building tools for this since I first saw this at the VR/AR Summit in Feb! Two of the coolest things that happened was getting a free Vive and seeing EVR. I’m looking forward to working on my first tool soon! Thanks for putting it out for us to play with! Thanks for sharing this early – great to see the progress on this stuff! I think limiting the user to 1 scale (other than the miniview) is overly restrictive. If you haven’t already, try Quill on Oculus. Using both grip buttons to grab, move and scale the world around you is much more intuitive than having a choice of either the 1:1 scale or a very limited zoomed out view. If the user could scale and move himself like that, then moving and scaling objects gets much easier too. Instead of the gizmo, just grab the thing with one hand (to move and rotate it) or both (to scale). Oculus Medium handles this pretty nicely. It took me ages to figure out how to get rid of the Primitives window. It should probably have a “Close” icon on it, rather than having to open the main menu again and select it. I’m looking forward to playing around with it more! Thank you for your feedback, Rob. It has been noted. Did you try the MiniWorld workspace? Nice! Though it would be nice if you focused on features that are actually important. Things like non-IL2CPP memory heap profiler or thread jobs should’ve been available ages ago. Should be obvious for any developer that people are skilled and focused in different areas and things do not happen any faster if you throw more people at it. Actually it can be the opposite especially in the case of IL2CPP. The VR editor is highly needed because you cannot do VR stuff effectively by watching it only from a monitor as for example the scale of things can go off so easily. Yeah, what also should be obvious to any developer is the fact that delivering stable performance is essential to any title. Heap profiler was a long-requested feature, but they just hide behind IL2CPP excuse, leaving us with memory leaks and obsolete Mono version up until 5.5. Multithreading was around since 2002, multicore CPUs were around since 2006, and in 2007-2008 we already saw many PC games utilizing multiple CPUs actively, such as Assassin’s Creed or Supreme Commander. Yet, we get a glimpse of it in Unity only now. The problem here is not about “throwing more people at it”, it’s about realizing the importance of these features. Up until the VR rise, Unity was much more about mobile games, and much less about PC platform that is supported ever since I became Unity enthusiast in 2010. Speaking of features delivered just in time, the instancing feature was introduced in 5.4, even though it was perfectly possible to implement it on engine level with DX9. For many years we were forced to implement hacky solutions when engine-level feature would’ve helped us greatly. 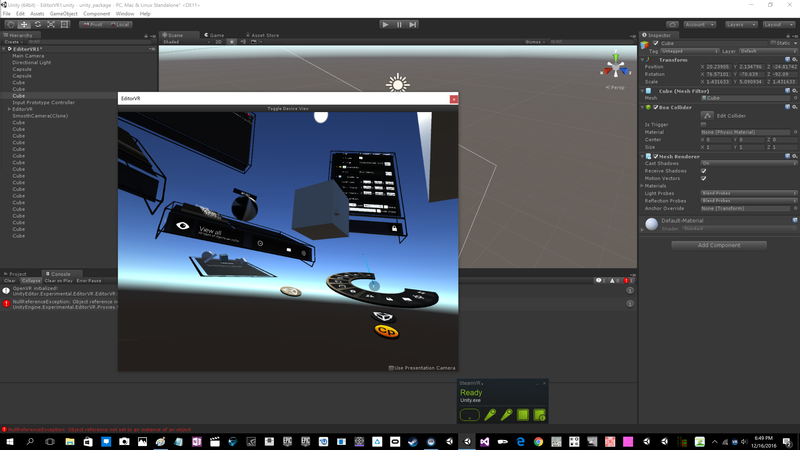 VR editor is here only because Unity wants to mimic what is already in Unreal Engine. “Scales off” is an excuse for weak artistic skills; experienced artists don’t have that problem simply because sense of scale is one of the basic skills an artist learns, alongside with color theory and composition. The problem here is that Unity focuses on too many things at once, wanting to satisfy every realtime need there is. And with a new license model, we are left to be paying even more, while still waiting to get things that are actually important. And with that rush to satisfy every possible demand – archviz, VR, realtime movies, games – it’s no wonder that every major version happily introduces game-breaking bugs. Unity’s been significantly multithreaded since at least 3.x, when they introduced the dual-thread rendering model. Please, next time you reply to comments, try reading them first. As I’ve stated earlier, I meant threaded jobs which’ve been announced only recently. Threaded rendering model has no direct relation to multithreaded game logic; and in many cases gameplay logic can easily outweigh or at least match rendering load in terms of CPU hit. Yes, we could use threads in the past, but inability to address engine API from several threads at least partially severely limited their use cases. They just don’t allow user scripts to call the API from non-main threads, because most users don’t actually understand what multithreading actually is or how it works. No, it’s just that Unity engine has never been thread-safe. Implying that Unity generously disabled access to engine API from multiple threads because most of its users don’t know what to do with it is probably the most far-fetched explanation I’ve heard in years. Ivan, different teams work on different things. Unity also has invested parties that sponsor features and the amount of money going into VR the past 5 years is money nobody can say “no” to. It’s a multi-billion dollar market beyond “just” gaming. Outside of gaming are some heavyweights with R&D budgets that make Unity look like small fish and they partner with companies like Microsoft that want Unity to develop these things. Some of these companies have R&D budgets larger than EA’s yearly revenue. We just don’t hear about some of these things unless we know someone or are working on it. Any decent software company has different teams working on different projects that are not skilled on other projects. That’s why they can move forward in some areas while another team may be delayed, stalled, or perhaps see something more important in the codebase that we’re not all privy to. EditorVR requires at least one partner (e.g. Oculus, Vive) SDK to be installed for input. Where we can download these from the Asset Store or from the partner’s websit? I had a VR presentation yesterday. In the morning I download the Unity VR asset from the asset store, and after few modification 4hs later I was able to make a full presentation VR showroom to a potential client at first build with no bugs! And I do not has a VR at the lab to test it! Also Unity made a presentation in my city, far away from the world and one of us get an Occ Rift donation from Unity! We probably share it between us. Thanx Unity, That was so Awesome! I am new to unity. I am an artist with a Vive. I have unity 5.5 and several assets. I installed the Asset of EditorVR but if I install the Experimental build then its installing an earlier 5.4 version and not sure if I need to do this or if it will affect any projects done in 5.5. Sorry if I sound stupid – not a programmer but love what I know so far about Unity and VR so want this badly – HELP! Fantastic! The future is here! Woooohooo! Can’t wait to try this out! Well, I know what I’m doing tonight. :) Thanks folks!